Recently there was a terrible cold snap and my fuel cap became frozen and would not open when I pressed the button near the bottom of the driver's door. 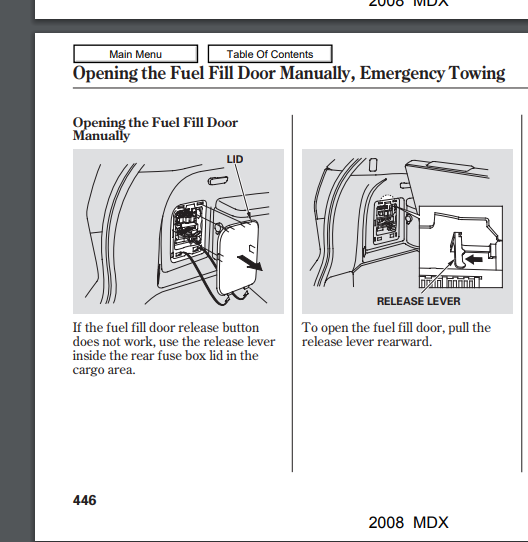 I found an entry in the Index that read something like "Fuel Cap - Manually Open". It said to open the fuse box in the rear of the car's interior on the left side and it showed a lever near the right side of the opening and explained that if you pulled that lever rearward, the fuel cap would open. It took me a very long time to figure out how to make this work and when I discovered how I figured I should post this info in case anyone else needs to know. The problem was that the lever is not visible and is not located near the right side of the open fuse box. Instead you must put your hand near the top of the opening and feel around up past the top. The lever is not visible but if you move your hand around a little bit you will find it quite easily. Then you just pull it gently rearward the fuel cap opens. I don't know what I would have done if I was almost out of fuel and needed to open that cap manually. It would have been a big problem. I fear I would have used a flat screwdriver to force it open and then face a large bill to repair it. I hope this info may be of value to someone else some day. P.S. To open the lid of the rear fuse box, use a small flat screwdriver but wrap it up in a soft cloth so that you don't scratch or otherwise damage the carpeting that covers the fuel box. You had the owners manual available. In case I didn't make it clear, the owners manual was of little use because it showed a diagram in which the lever was plainly visible. But the lever is not visible at all. You have to stick your hand up and feel for it. I've found other sections of the manual that are very poorly written. I don't mean the English is bad necessarily. I just mean that there is a real divide between the info in the manual and the reality. By the way, the current mystery I'm working on concerns the heater and where the heat comes from if you direct it to the lower part of the driver's compartment. When directed towards the drivers face, I can feel it plainly and can easily tell where its coming from. Can anyone please tell me where it is supposed to come from when you direct the heater to blow warm air onto your feet. I cannot feel any air no matter how high I turn up the fan. I figured that I owed it to anyone reading my post about the floor heater vents to try and see what the manual says before asking for help. 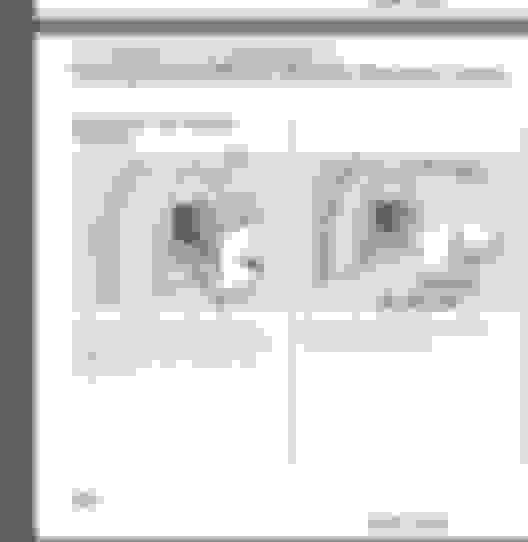 I found "Climate Control" in the index and there is a diagram in that section that shows there are 4 heater vents at body level which correspond to the setting that shows a horizontal arrow. The manual describes these as the "center and corner vents in the dashboard". It also shows two other vents called the "floor vents". They are shown coming from the console at the center of the front seat. One for the driver and one for the passanger. But I cannot detect any heat at all coming from those vents. I suppose there may be something broken or there may be some way to adjust the heat flow - like maybe a wheel you turn (which is the way to adjust the other heat vents). But I can't find those kinds of controls anywhere near the supposed location for the floor vents. So many mysteries with this car. I guess I have to consider it all part of the adventure. Oh well.